Contain toluene, benzene, formaldehyde, ethyl benzene, styrene, acetone and a host of other chemicals that are known carcinogens and produce fetal abnormalities in test animals. These chemicals also cause hallucinations, nerve damage and respiratory illness in humans. Please refer to this article: "Toxic Emissions from New Carpets"
That 'new carpet smell' comes from 4-PC, associated with eye, nose and upper respiratory problems. 4-PC is used in the latex backing of 95% of US carpets. Other compounds that affect your health are adhesives, flame retardants and stain protectors. In 2000 the 3M Company removed the chemical perflouro-octanyl salphonate from their product, Scotchgard, because it had been found to cause reproductive problems in rats. Mothproofing chemicals contain naphthalene, which is known to produce toxic reactions, especially in newborns. Fire retardants often contain PBDEs which are known to cause damage to thyroid, immune system and brain development functions in humans. Older carpets don't fare any better. Even though some of the hazardous Volatile Organic Compounds ( VOCs) may have dissipated over time, many of them contain chemicals that have been banned in later productions. They are also likely to carry a heavy burden of dust mites, dirt, pesticides and other toxins brought in on shoes, feet and pets. Carpets can hold eight times their weight in toxin-filled trapped dirt that is well hidden in the fibers and underneath the carpet. The EPA has stated that 80% of human exposure to pesticides occurs indoors. Every time you spray for bugs or use a fogger, the chemicals settle in your carpet and remain there for years. If you paint your room or put in new wood or laminating flooring in any part of your house, the carpet is very efficient at holding those toxins for you to inhale long after the work has been completed. Older carpets expose you to hazardous chemicals that are 10 to 50 times higher in a carpeted room than outdoors. Your risks increase substantially, if you have plush or shaggy carpeting. The obvious preferred option would be to get rid of any carpeting to reduce your exposure to carpet toxins, and replace carpeting with tiles, wood or bamboo or alternative natural flooring. However, keep in mind that just because a product is labeled 100 percent wool doesn’t necessarily mean that it’s 100 percent toxin-free. Most carpets are chemically treated, so be sure to inquire whether a rug or carpet is all natural and pesticide-free. There is a good chance that you will find out that it isn't. Note: Wool isn’t a good choice for kitchens, bathrooms or entryways because once moisture soaks in it takes a while to dry. 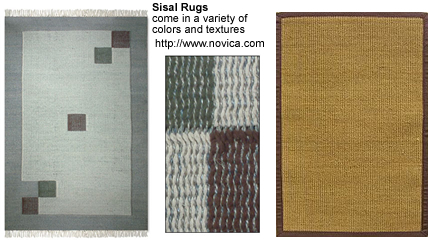 Sisal rugs are also gaining popularity. 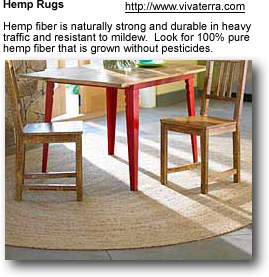 Rugs made from corn leaves, stalks, sea grass, jute or coir (coconut-husk fiber) are also increasingly available. Not only are most of them washable, they can also be thrown in the compost pile at the end of their useful life. NOTE: Even with these above "green" rug options, please MAKE SURE that they are 100% organic, pesticide free and that NO CHEMICALS have been applied. Certified Carpets: Choose a carpet with the Green Label Plus Certification. These carpets have passed independent laboratory tests for emissions from thirteen notorious chemicals. Skip the Glue! Don't glue your new carpet to the floor - attach it with staples instead. Non-toxic Carpet Maintenance: Lastly, once you’ve selected and purchased your carpet, make sure you use only non-toxic cleaning products to avoid contaminating your flooring material. 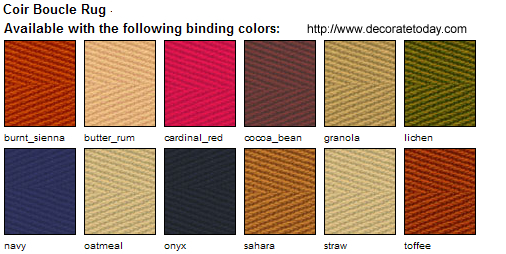 This webpage provides you information on non-toxic carpet cleaning. You will find great tips on how to safely remove all kinds of stains from your carpet using environmentally friendly products, many of which you may already have in your pantry. Stop the dirt from entering your house: A good doormat will stop a lot of toxins right at the door; and it's best to remove your shoes when entering your house. Invest in the best vacuum cleaners you can afford (the more powerful the vacuum cleaner, the more toxic particles and dust mites will be removed). HEPA vacuum cleaners are preferred. Low quality vacuum cleaners are not sealed well. Even many of the filtered ones often leak air through gaps in their cases causing dirty air to blow back into your indoor environment. Steam cleaning sanitizes the carpet and kills dust mites and bacteria. Air the house frequently to stop toxins from building up in your home. If you like plants, there are actually beautiful indoor plants that generate oxygen and remove toxins from the air. Finally, get a Quality HEPA Air Cleaner or Air Purifier that will remove dust and toxins that rise from the carpet or rug every time you step on it or vacuum. If you follow as many of these precautions as possible, you will certainly have a cleaner and healthier home! Journal of Nutritional and Environmental Medicine (1995) 5: 375-386. Many hundreds of people have felt suddenly ill 1 to 3 days after installing a new carpet in their home or office. Some noticed that the carpet appeared to be wet - as if the manufacturer hadn't finished his job. We have studied several hundred of these carpets in our laboratory. Under carefully controlled conditions, we had groups of laboratory mice breath air containing the mixtures of chemicals released by these carpets. Like the people, the mice became acutely ill with irritation of the eyes, nose, and throat, difficulty breathing, and altered nervous system function(showing up as tremors, falling, alered posture, paralysis of legs, stupor, and convulsions). Some of the mice died as a result of exposure to these carpet gases. The data demonstrate that certain carpets release toxic(poisonous) chemicals into the air. Numerous studies have shown that there are over 200 chemicals in the mixtures of gases which are released by new carpets. No one has made a serious attempt to determine which of these chemicals is responsible for the acute illnesses which occur in certain new carpet owners. The symptoms reported by the owners of these carpets were diverse: headache, confusion, loss of memory, depression, dizziness, burning eyes, nose, and throat, difficulty breathing, fatigue, weakness, skin rash, hair loss, etc. Julius Anderson. Journal of Nutritional and Environmental Medicine(1997) 7: 177-185.